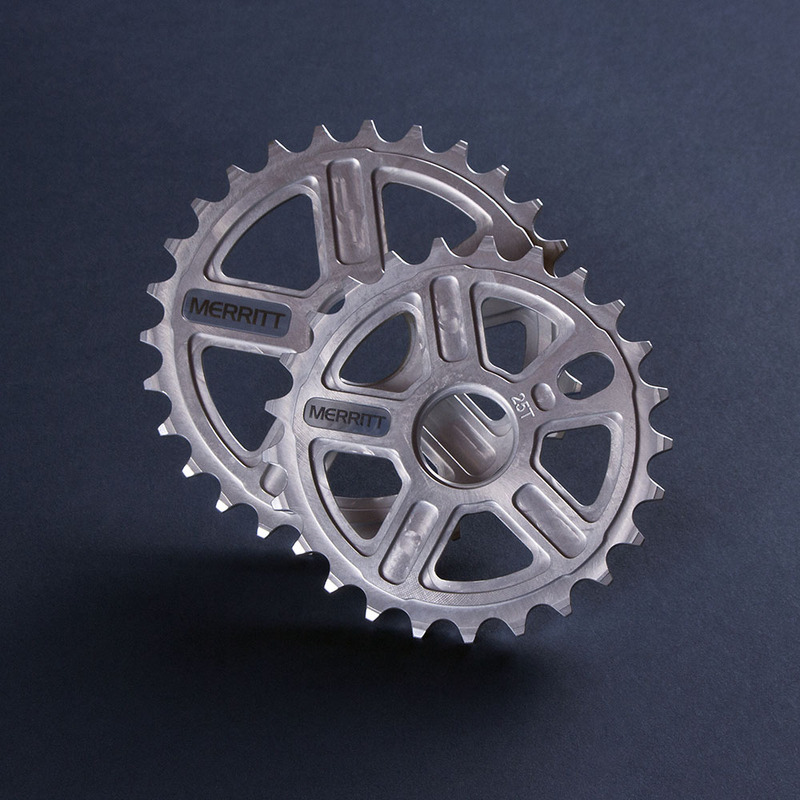 Simple, clean and strong, Chris’ signature sprocket is badass. CNC’d from 7075 aluminum and includes flush fit adapters for 19mm, 22mm and 24mm cranks spindles. Available in 25T, 28T and 30T. Made in the USA from 1/4″ thick 7075 aluminum with a laser etched polycarbonate insert. Comes with 19mm, 22mm and 24mm flush mount crank spindle adapters. 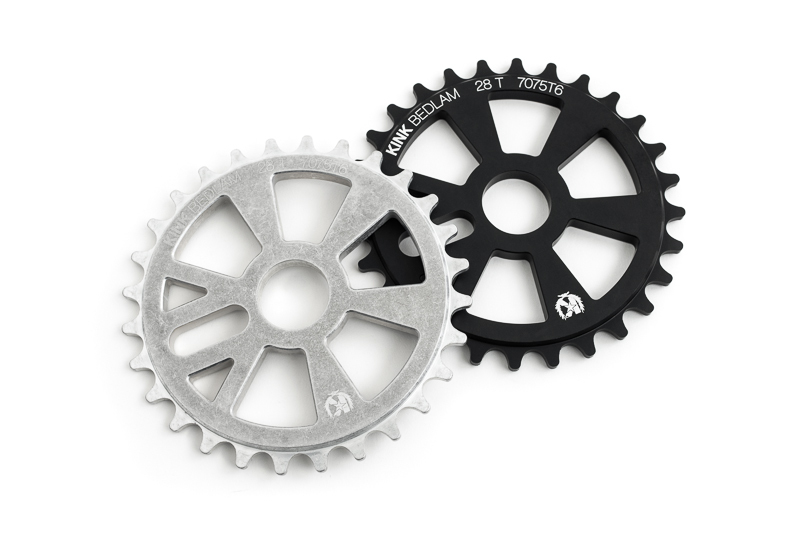 The Supreme SCD solid sprocket is a nod to the classic CD style sprockets that used to be the only thing worth running on a freestyle bike. 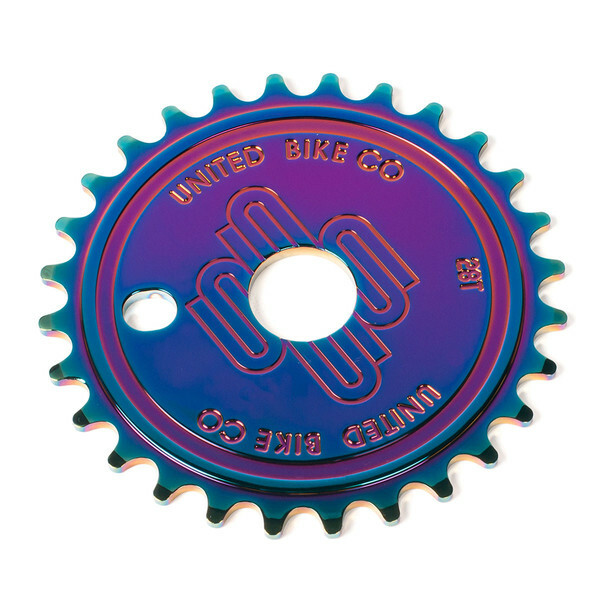 Updated for today’s modern riding by using 4mm thick CNC machined 7075-T6 alloy, a 23.8mm centre bore which is compatible on cranks with 19, 22 & 24mm spindles and finished off with CNC machined United logo detailing. 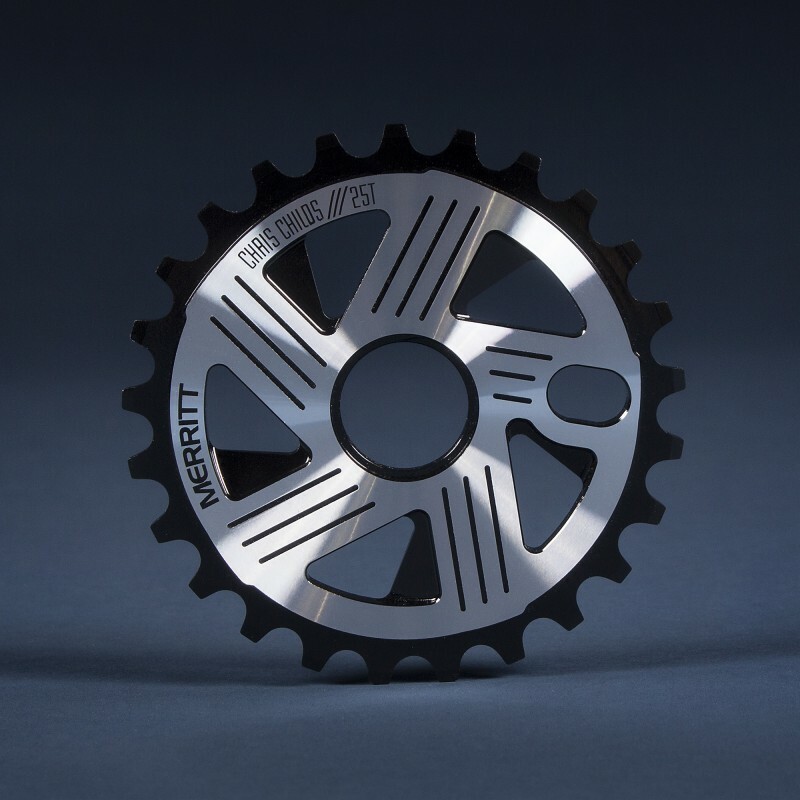 The benefit of a solid design means even by using a thinner width material, you are getting a way stronger unit by not creating any points of stress like can happen when machining out complex holes and designs, and also a sprocket at that is a way more affordable price. 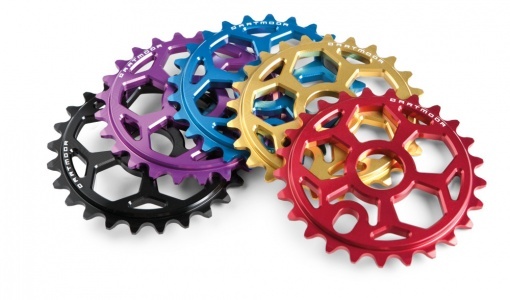 The Star sprocket will really set off your dream build, with its cool flowing lines lovingly CNC machined from a block of 7075 aluminium. 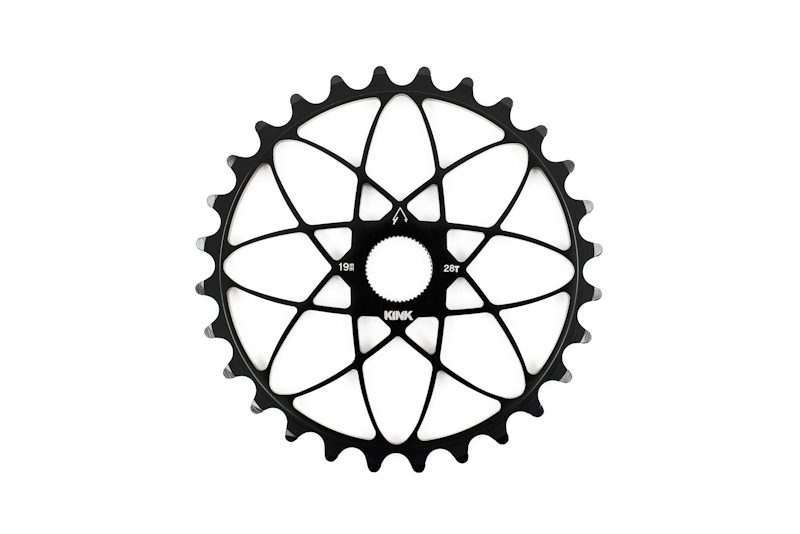 This high end sprocket with 10 spokes design will come in a set with alu adapters for both most popular spindle diameters. Size: 23T, 25T, 28T, 33T. Weight: 56g (23T); 66g (25T); 80g (28T); 97g (33T). Available spare parts: adapter for 19mm and 22mm spindle. 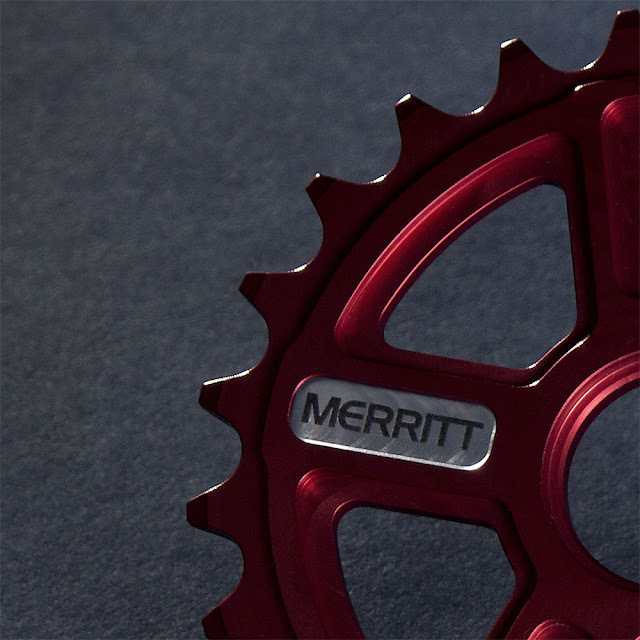 Light and strong BMX sprocket with Dartmoor logo shape cut in the body. Made of alu 7075. CNC machined. Adapters for 19mm and 22mm axle included. For BMX chains (1/8"). Weight: 56g / 1.98oz. (23T), 65g / 2.29oz. (25T), 90g / 3.17oz. (28T). 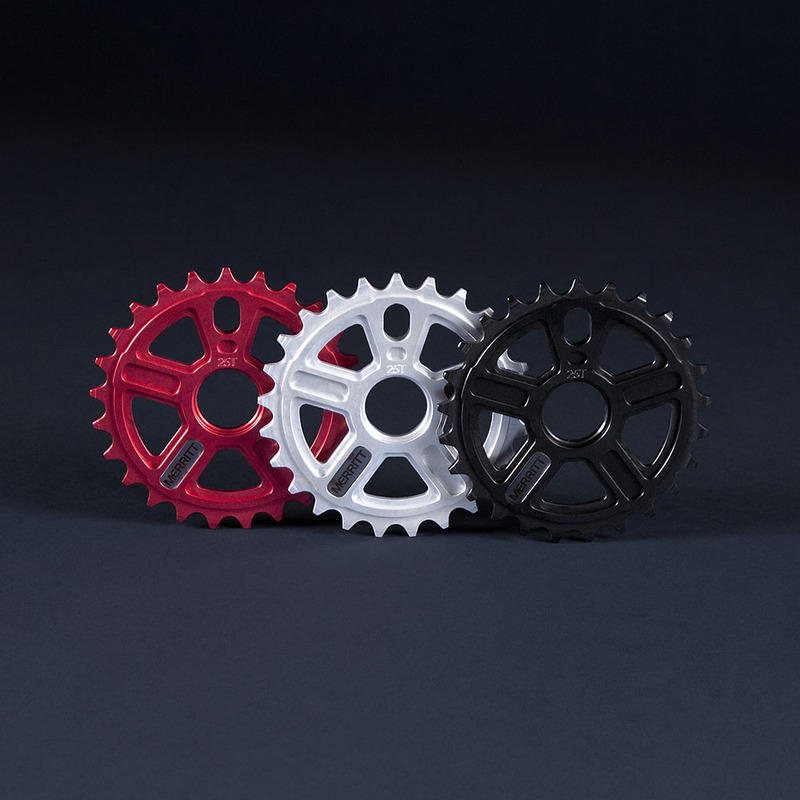 Light and durable BMX sprocket. Made of alu 7075. CNC machined. Adapters for 19mm and 22mm axle included. For BMX chains (1/8"). Weight: 58g / 2.05oz. (23T), 66g / 2.33oz. (25T). 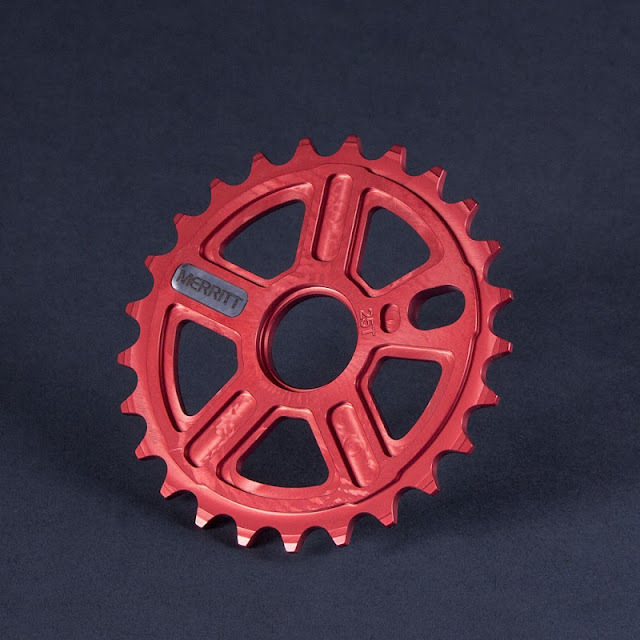 One of the lightest MTB narrow-wide chainrings on the market. Made of the high quality 7075-T6 aluminium with fully CNC machining according to our custom design. Trail chainring is compatible with 11-speed drivetrains and thanks to the special narrow-wide teeth shape it maybe used as a single chainring without a chain guide. This function was confirmed by our Enduro and All Mountain team riders. Weight: 36g / 1.27oz. (32T), 45g / 1.58oz. (34T), 57g / 2.01oz. (36T). 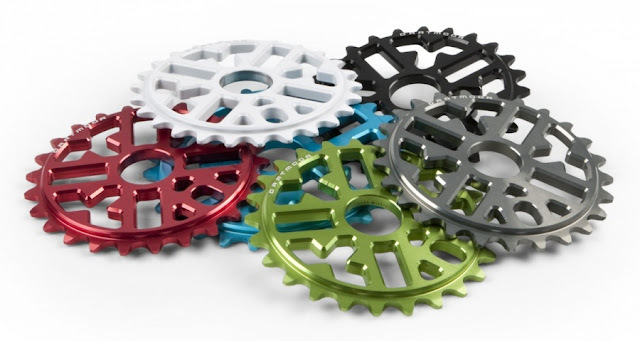 Lightweight MTB chainring made of high quality 7075-T6 aluminium. Fully CNC machined according to our custom design. 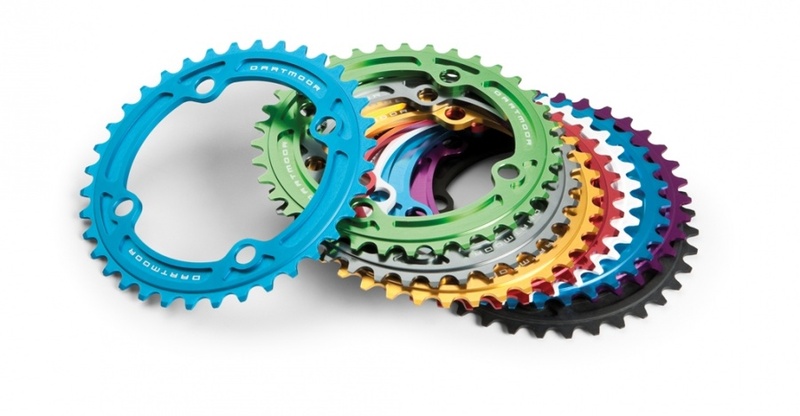 Up to 30%-40% lighter than 6061 aluminium chainrings. For MTB chains (3/32"). Size: 32T, 34T, 36T, 38T. Weight: 40g / 1.41oz. (32T), 50g / 1.76oz. (34T), 63g / 2.22oz. (36T), 79g / 2.79oz. (38T). 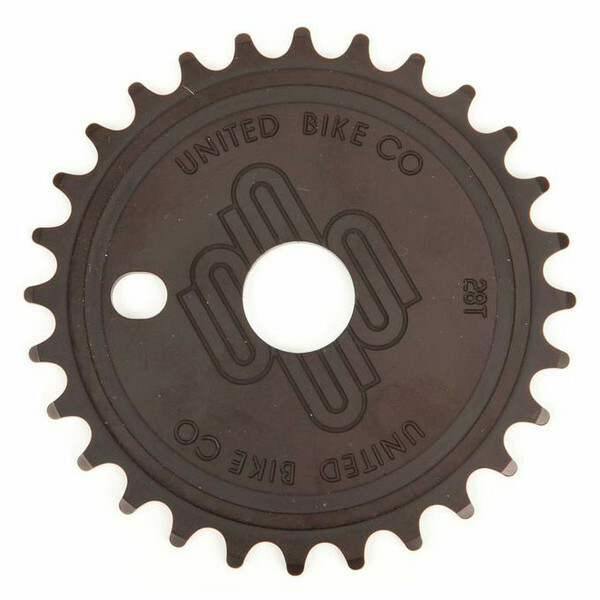 Ultralight and durable MTB sprocket for singlespeed drives. Made of alu 7075. CNC machined. For BMX chains (1/8"). 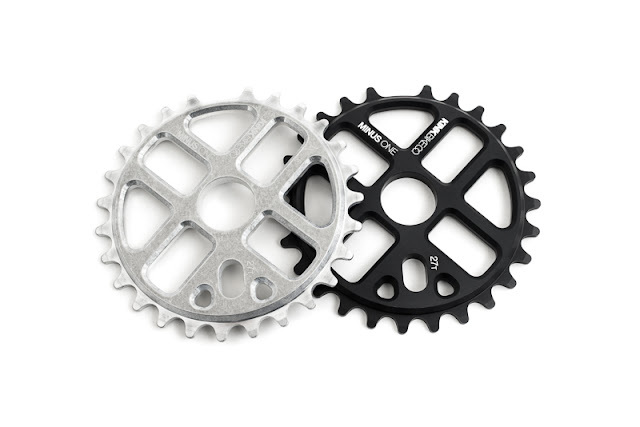 For those who use driver hubs (9T-11T) but prefer to keep lightweight MTB cranks. Weight: 28g / 0.99oz. (23T), 38g / 1.34oz. (25T).